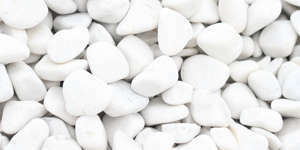 This is the quintessential landscaping stone and it is available in two formats: white crushed boulder and white pebble. It is made from white marble, Canteras el Cerro uses pure white marble stone, is a stone with a very bright white and without particle of other colors. Our available grain sizes are 6-12, 12-24, 24-40, 40-60, 60-100, 100-200 and 200-400 mm. we served bulk, big bags and metal cage. Usually, big decorative boulders are served in metal cage.